10 Pinterest Boards for Learning Foreign Languages - Look! We're Learning! Hi everyone! We’re linking up with another great iHomeschool Network hop to share the best Pinterest boards for learning foreign languages! Browse through the boards below to find some great pinners to follow for foreign language resources! Follow Curriculum Choice’s board Foreign Language on Pinterest. Follow Angie | RealLifeAtHome.com’s board Homeschool – Foreign Language on Pinterest. Follow Selena @ Look! We’re Learning!’s board American Sign Language Lessons on Pinterest. Follow Ticia Adventures in Mommydom’s board languages on Pinterest. 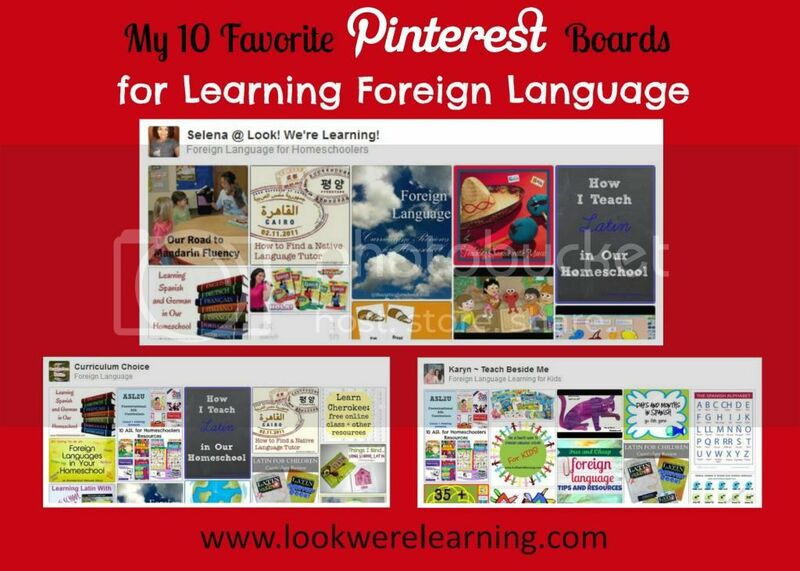 Follow Karyn ~ Teach Beside Me’s board Foreign Language Learning for Kids on Pinterest. Follow Eva Varga’s board Snakker du norske? on Pinterest. Follow Eva Varga’s board Nihao。你好。 on Pinterest. Follow Eva Varga’s board Sí Se Puede on Pinterest. Follow Amy T @ Are We There Yet?’s board Homeschool – Foreign Language on Pinterest. Follow Selena @ Look! We’re Learning!’s board Foreign Language for Homeschoolers on Pinterest. If you have any foreign language boards on Pinterest you follow, let us know about them in the comments! Thank-you for sharing my board! You’re welcome! You’ve got a ton of great resources! What a great idea for a post! I am filling a Pinterest board for language learning too, as I want my children to learn another language, but so far I haven’t decided what we are going to do yet. Thank you for sharing! Learn them all! Just kidding. 🙂 I just introduced several and let the kids decide what they were interested in. Plus, I’m taking Spanish in college, so that kind of helped influence the decision…lol. Thanks for visiting! This is great, off to browse! What an awesome idea– GREAT Resource- thanks! I homeschooled my kids before there was Pinterest….oh how I wish that I could start all over again. The resources that are available online now, makes my head swim. These are great boards, and I’ll pass the link to this post, on to several of my grown daughters to use with their children. This is perfect for homeschooling families! What a great resource for learning various foreign languages. This is perfect for planning the next school year! Yay! I hope you can find some good resources to use! Thank u for sharing this! This makes our newly begun homeschooling journey so much easier! shared on fb & pinned! Home u will take a look at our reasons for wanting to homeschool that I just posted about – plz feel free to send yr ideas my way! I need the badly!!!! Thanks for sharing this at the #WWDParty! Thanks Tricia! It’s a great resource! What a great roundup! I am excited to pin this for my readers. They’ll love it! Hi there, beautiful momma! This is a fantastic roundup you’ve shared …. we’re Latin studying folks here, but we might delve into some other options after being inspired here! Big hugs and thanks for linking up with The Thoughtful Spot!